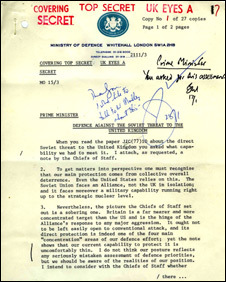 Prime Minister James Callaghan described the situation as a "scandal"
Documents marked "Top Secret, UK eyes only" which have just been de-classified by the National Archives, show the Labour government of 30 years ago was engulfed in a furious row over the inadequacy of the nation's defences. 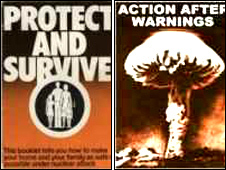 The papers paint a picture of a 1970s Britain that would have been virtually helpless in the face of a Soviet attack. As the public were being advised on how to prepare for a three-minute warning, government briefings made it clear their efforts would have been a waste of time. Just released by the National Archives, conversations in 1978 between the then Prime Minister James Callaghan and his defence secretary, Fred Mulley, describe the country's defences as "outweighed", "outnumbered" and "insufficient". 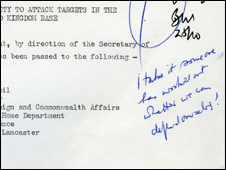 The damning assessment came after Mr Callaghan ordered a defence analysis in response to a Joint Intelligence Committee (JIC) report on the scale of the Soviet threat to the UK. In reply, Mr Mulley wrote: "The picture the Chiefs of Staff set out is a sobering one." I take it someone has worked out whether we can defend ourselves! "Air defences would be outweighed because aircraft would be outnumbered and stocks of air defence munitions would sustain operations for only two or three days. "The Army would be able to counter the currently assessed Soviet land threat during the initial stages of war but, lacking supporting arms and logistic support, it would be inadequate to deal with any significant threat. "In the case of nuclear attack by ballistic missiles there would be no defensive capability, save the indirect defence of our nuclear forces." 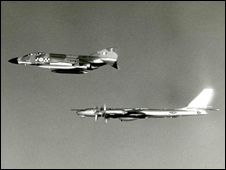 In the air, the UK would be forced to confront an estimated 200 Soviet bombers with 98 fighters, resulting in destruction to the UK many times worse than that delivered by the German Luftwaffe. At sea, the country's force of minesweepers and mine hunters numbered "only 32" and were considered "obsolete". Mr Callaghan was furious. He described the lack of air munitions in particular as a "scandal" and said "one or two people should be sacked", although he did not include Mr Mulley. The documents are scrawled with his exasperated comments. At one point he writes: "Heaven help us if there is a war!" At another: "I take it someone has worked out whether we can defend ourselves!" The assessment also had implications that reached beyond the fate of Britain. Mr Mulley wrote: "It is unlikely that the UK defences could prevent the loss of a substantial proportion of Nato's forces based in the UK, including important US assets. This would, he said, "significantly reduce Nato's ability to sustain conventional operations successfully in Europe, in the eastern Atlantic and in the Channel areas". Their conclusion was also sobering. It showed a realisation that Britain could not hope to stand alone against the Soviet war machine. One letter to the prime minister reads: "The problem is made worse by the rate at which the offensive capability which the Russians might use against the United Kingdom is growing. We shall have to run hard to stand still. "Though the secretary of state for defence's report on the United Kingdom's direct defences is a worrying one, we should continue to rely on the collective deterrence offered by the Alliance as the main source of our security." In the end the attack never came and just four years later the country was at war on the other side of the Atlantic, over the Falkland Islands. According to William Spencer, a military specialist at the National Archives, since the row in 1978, both the military threat to the UK and how the nation's forces prepare for it, have changed dramatically. As the Cold War ended, the emphasis on fighting a nuclear war with a major European opponent declined. The UK's nuclear capacity is now limited to submarine-launched intercontinental ballistic missiles - Trident - and the military's focus has moved towards a much more global commitment. The British military is spread more thinly across a variety of different conflicts and operations - a force that has to be both more mobile and multi-tasking. The need for powerful alliances, however, remains a cornerstone of British defence strategy.